There’s no place like home for Jennifer Rizzotti. Make that no place likes homes. The George Washington women’s basketball coach and Team USA assistant coach traveled with the national squad to Bridgeport’s Webster Bank Arena this past weekend. The New Fairfield native returned to the state where she made a name for herself as a player at UConn and as a coach at the University of Hartford. Rizzotti was a star at New Fairfield High and led the Rebels to two state championships. The winning continued at UConn as she helped guide the Huskies to the first of their 11 national championships in 1995. Her length-of-the-court drive that gave UConn the lead for good with 1:51 left may be the single-most memorable play in program history. As a senior, she was named an All-American for the second time and was selected the Associated Press Player of the Year and the Wade Trophy winner. She was inducted into the Women’s Basketball Hall of Fame in 2013. She started her professional career with the ABL’s New England Blizzard and then played five seasons in the WNBA, winning two championships with the Houston Comets. She was with the Comets when she got her first coaching job at Hartford. The Hawks made six NCAA Tournament appearances in her 17 seasons before she made the move to GW in the nation’s capital. Making the move to George Washington was tough professionally and personally, but Rizzotti was ready for another challenge. And those who have followed her the past quarter-century knows she’s never been a person to back down from one. “My loyalty to Hartford was strong,” Rizzotti said. “It was hard for me to walk into that locker room and tell them that I was going because they were my family and they were my kids. But I knew I wasn’t going to be happy staying there. I felt stagnant. I felt like I had given everything that I had to build that program and get it where it was. I thought it was going to be too difficult to improve it any further. George Washington won 20 games and advanced to the 2017 WNIT in her first season. In Year 2, the Colonials captured the Atlantic-10 Conference Tournament title and the league’s automatic bid to the NCAAs. Her current squad took a tour to Spain last month and she was excited by what she saw. She has a young roster with two seniors and no juniors. She’ll be returning to Spain later this month as Team USA seeks its third straight gold medal at the FIBA World Cup in Tenerife. 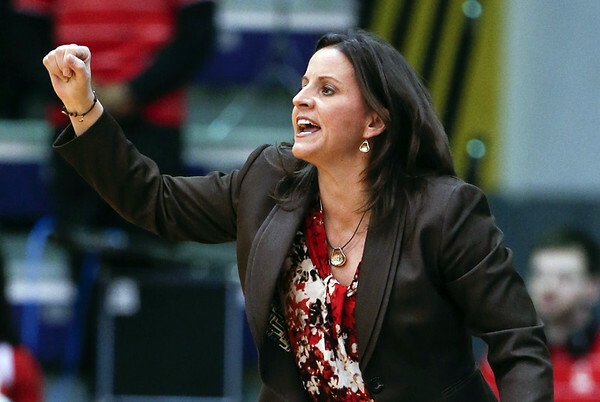 Her spot on Dawn Staley’s staff is her seventh coaching position with USA Basketball. That includes being the head coach of the 2010 U-18 team and 2011 U-19 team that won gold medals, and serving as an advance scout/court coach for Geno Auriemma’s gold-medal winning 2016 Olympic team and 2014 World Cup team. “I just enjoy the program,” Rizzotti said. She is also the chairperson of the USA Basketball women’s junior national team committee, which was responsible for selecting the athletes and coaches for the USA-18 national team. The 2018 U-18 team that included UConn freshmen Christyn Williams and Olivia Nelson-Ododa qualified the United States for the 2019 FIBA U-19 World Cup. Posted in The Bristol Press, UConn on Tuesday, 11 September 2018 21:53. Updated: Tuesday, 11 September 2018 21:55.